I've never even heard of Pink Panther before. I wanted a pre-roll to get my head right before budtending, and this is what was handed to me. "Try it" I was told. The smell off this was super-candy fruity with the least little tang of diesel underneath. 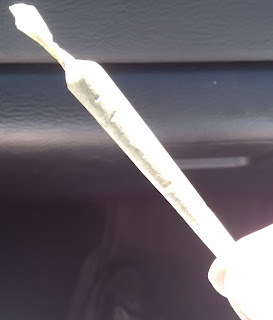 This is the most sweet-smelling sativa I've encountered in a pre-roll. The smoke was expansive, but not crazy. It definitely filled me up. The flavors are super-sweet berry and other fruits, and the diesel I smelled carried over into the smoke as just an aftertaste on the back of more candy sweetness. Immediately after enjoying this, I started smiling. Then when I got back to the store and went inside to budtend, I encountered another human and the smile turned to giggles. Those giggles and smiles lasted for a couple of hours while I had an absolute blast helping people find the best pot for their desires. The uplift had huge legs, lasting me quite a long time and I was very active and constantly going. There will be nothing stopping me from getting more Pink Panther as soon as it crosses my hands. This was outstanding happy good times Sativa and I want to dance with it again. Badum. Badum. Badum adum a duuuuum.